Have you been advertising your Granges activities? This is the start of a new Grange year and you should have completed your plans for the year. Now you should implement those plans. What are you waiting for? Today can be the first day of the best Grange year you have ever had. Think positive. Pursue casual acquaintances. Everyone you contact may just be waiting to be asked to join the Grange. ADVERTISE your activities. Let your fellow townspeople know what a great active group you are. Tell the world just how great the Grange is. "Blow our own horns" ADVERTISE! People don't know if we keep it a deep, dark secret. Don't be ashamed to say "I BELONG TO THE GRANGE. WHY DON'T YOU JOIN US? SOME OF THE NICEST PEOPLE I KNOW BELONG." Your own actions and activities are the best free publicity the Grange can get. Don't speak in a negative manner. Stress all the good points. Every member of your Grange is a walking, talking advertisement. Remember, we need positive publicity. 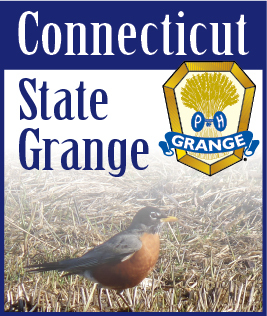 Let today be the start day of our newer and better Grange year in Connecticut.